Happily Unmarried is a brand not unknown to anyone. Known for their quirky yet appealing and effective products, it was a pleasure to know of their foray into personal care products. 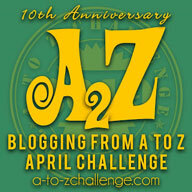 Today I will share my review of Happily Unmarried Body Wash, Lavender and Vetiver with you. Shelf Life/ Expiry: 24 months from the date of manufacture. 1) Initially the brand name "Happily Unmarried", which is a well known and trusted brand, attracted me towards this product. 2) The claim that this product is Sulphate and Parabens Free is another appealing aspect of this body wash. I always use and advocate products that are free of harmful chemicals and thus, skin friendly. 3) The ingredients of Happily Unmarried Body Wash are known skin rejuvenating components like Lavender, Vetivar and Aloe Vera. I have been using this body was for almost two weeks now and have seen a marked improvement in my skin health. My skin is more soft, supple and vibrant. 4) Suited to all skin types, no one in my family (we are varied skin type bunch right from dry, combination to oily skin) faced any allergic reactions from using Happily Unmarried Body Wash.
5) With a purplish semi liquid consistency, the fragrance of this body wash is pleasing, subtle and does not irritate. It lingers for a while after a bath and is soothing, relaxing and makes me feel fresh each time I use this product. 6) You will feel soothed, fresh and all your tensions swept away from your body after you use Happily Unmarried Body Wash.
7) Cant say much about the dark spot reduction claim of the brand about this product but my skin tone has definitely evened out ever since I have started using Happily Unmarried Body Wash.
8) The packaging is sturdy, spill and leak proof. It comes in a bottle with a flip open cap that makes it easier to squeeze required amount of body wash without wastage. 9) The delivery from Amazon was speedy and the packaging well done. 10) I loved the beautiful quote on the bottle "All You Need Is Love and Lavender.". If you are looking for a different type of gift then this body wash will make a great gift. 1) Happily Unmarried Body Wash, Lavender and Vetiver, has a very light fragrance that is almost missed and I feel it should be made more concentrated to make this body wash more appealing to the senses and have a better lingering effect on the body after use. 2) This product is pricier at 200 ml as compared to the other body washes available in the market. 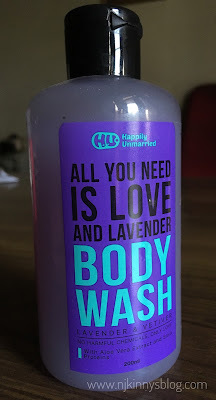 All in all, Happily Unmarried Body Wash, Lavender and Vetiver, is a promising new product from Happily Unmarried. It is effective, skin friendly with no skin harming parabens and sulphate and comes in a travel friendly sturdy packaging. The only let down is the fragrance that I really wished was more concentrated with more lavender feel in it. Njkinny recommends this product to people looking for a chemical free body wash that nourishes and is gentle on the skin.